Click to read an article in Raw Pet Digest on the Gentry Boxers Breeding Program! The simple answer is we believe that real food – food that approximates the authentic canine diet – is healthier than standard store-bought kibble. And by treating common issues with natural remedies and thereby avoiding over-exposure to chemicals, dogs may stand a better chance at sustained health. Gentry Boxers is a Natural Rearing Breeder. 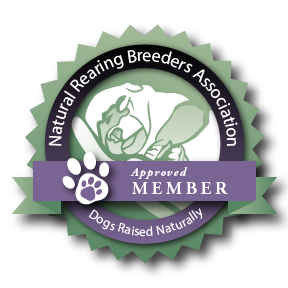 At the time of writing, we currently have the only credentialed NRBA boxer breeding program in the world. 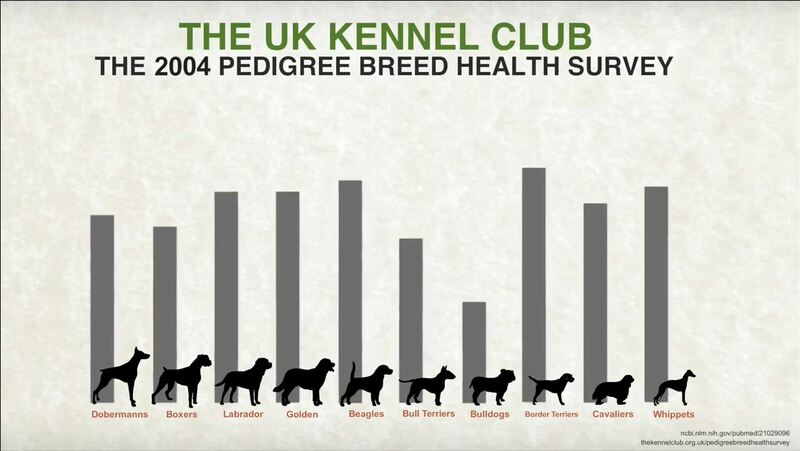 However, we are working to involve and educate other breeders to work with and enlighten them as well. to the benefits of natural rearing. This means that we first and foremost feed a species-specific natural diet including meat, bone, organ, and appropriate supplements. We also employ no chemicals or poisons, use only homeopathic vaccinations and methods to boost immunity, use energy and holistic healing methods supported by kinesiology and flower essences, train using "clicker" or positive reinforcement, and encourage our clients to do the same. The new science of epigenetics is informing us of the fact that environment is just as important in triggering genetic predispositions as are the inherited genes themselves. This is a new and exciting science that offers hope for those who want to avoid triggering genes that may cause dis-ease symptoms. That is one of many reasons why we have moved to natural rearing, eliminating toxins from our home, feeding a healthy raw diet with great supplementation, avoiding the use of antibiotics, steroids and heartworm poisons, and eliminating injectable vaccines from our support program. We provoke natural immunity in our puppies after maternal antibodies have waned by gently exposing them to non-lethal forms of the pathogens. 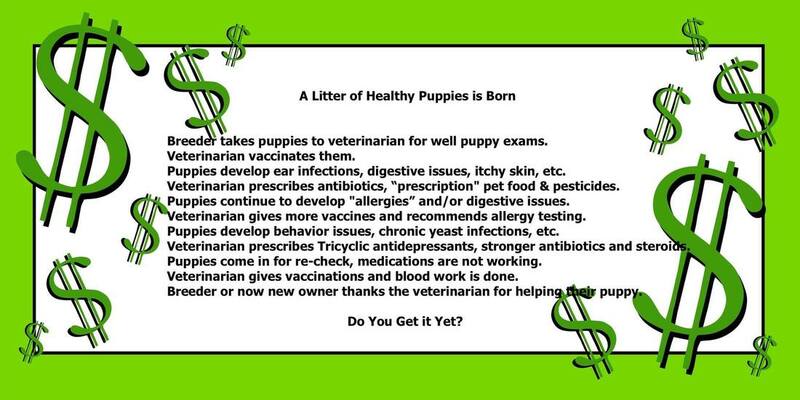 An ideal place to start is in Puppy Kindergarten where they can come in contact with recently vaccinated puppies, bringing non-lethal pathogens into the body through nose and mouth as Nature intended. We recommend a book called Natural Immunity by Pat McKay to help you do this yourself. Our dogs cannot make these decisions for themselves, thus we must be mindful stewards of our breed and pet family. The other "MUST HAVE" book is called Natural Rearing by Dr. Jeannie Thomason. I want every puppy buyer to read both books before taking one of our puppies home with them. If you are new to raw feeding, this is an excellent book by Animal Naturopath Kristin Clark Let Food Be Their Medicine. We have been in intensive training on the use of therapeutic essential oils to support animals and people in recent years, and are experiencing some pretty amazing shifts in wellness in our animals and ourselves. I am certified in the Chemistry and Applications of Essential Oils and have extensive advanced training focusing on animal applications. I have researched the quality of various EO products and recommend the use of Young Living exclusively, as their Seed to Seal quality control process satisfies the need for therapeutic grade oils unavailable with many other brands. We never use Over the Counter oils, as they are not only mostly ineffective, but can do harm to people and especially to animals and kids. We have formed a learning team under Kindred Animal Spirits to help people to learn to use therapeutic grade essential oils to support animals. If you are interested in joining our team, please contact me and I will help you to get the information you need to use essential oils safely and effectively. We are all about quality of life and longevity, and want to help you with those goals no matter where your animals came from. We use no heartworm insecticides (Heartguard, etc.) and run routine heartworm antigen tests. This can be done very economically by sending serum directly to a lab. We currently use either Hemopet or Texas A&M. As of this writing, the cost is approximately $20. A blood draw is required that is then spun down to serum. If you can't do this yourself, ask your vet to pull about 8cc of whole blood and spin it down to 1-2cc of serum for you. Most vets will do this for around $15-25. Our dogs live in one of the most mosquito-intensive parts of the United States, and we have not used traditional heartworm preventatives for years. We have never had a positive screen for heartworm, but if we ever do, we will use natural means to treat them. We also utilize Animal Communication, an intuitive way of communicating with our animals to sense emotions, physical conditions, and generally to have conversations about lots of topics. This is a skill that all of us innately possess, but many people simply do not use or trust in themselves. It is a skill that can be developed with training, patience and practice, and we highly recommend that all animal breeders and pet lovers look into this valuable tool to make their breeding programs work better and improve the lives of the animals in their care. Every puppy that we raise is epigenetically intended to contribute longevity and vitality to our beloved boxer breed. Since there are very few, if any, true natural rearing boxer breeders in the world, we must take steps to rejuvenate our breed's decreasing longevity statistics. We are experiencing chronic genetic illness at an in precedented rate. 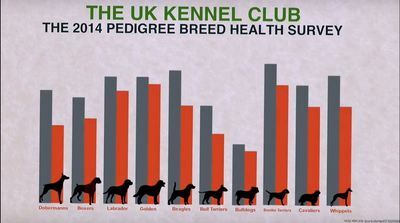 Longevity is at an all time low for the breed since we began breeding over 40 years ago. Mindful breeding of epigentically conscious naturally reared dogs is critical to our breed's health. We are losing our breed to poor diet, harmful chemical onslaughts and over-vaccination, frivolous use of synthetic antibiotics and systemic insecticides with tragic consequences. Between the years 2004 and 2014, the average lifespan of a boxer went DOWN by 1.3 years from 11.3 years to 10 years of age at death. For that reason, every puppy born and raised here and through our tribe of partners must remain in the breeding population. If they are structurally sound and are fully health screened to Breeder of Merit requirements, their DNA is critical to protect future generations. We cannot do this alone. We invite you to consider joining our growing tribe of breeding partners by purchasing a naturally raised Gentry Boxer, providing your dog with positive reinforcement training towards a purposeful, titled job, and entering into a breeding contract with us to help in this important goal of increasing longevity and vitality in the boxer breed. We maintain close contacts with our puppy buyers throughout their lives via phone and a secret training group on Facebook. Therefore, all puppy buyers must have an active Facebook account so that we can provide instruction and receive your feedback in a supportive group environment. Our group is extremely supportive and loving. You will find that previous puppy buyers will also help you as you navigate this beautiful world of natural rearing, and we are a "Facebook tag away" from helping with anything you want to learn. According to a large survey by the United Kingdom Kennel Club, boxer lifespans are down by 1.3 years between the years 2004 and 2018. This is tragic. I believe it can be fixed with natural rearing and attention to epigenetic influences along with full health screening of as many dogs as possible in the breeding program and relatives. I have been traveling the country on the lecture circuit teaching epigenetics and natural rearing to breeders and pet owners alike. I keynoted at the American Boxer Club Nationals under the sponsorship of the ABC Health and Research Committee, and recently taught at the Young Living Animal Conference with other animal health professionals such as Rodney Habib, Dr. Nancy Brandt DVM PhD, Dr. Jodie Gruenstern DVM, and many others. This is a video of the basics of epigenetics for you to learn more. 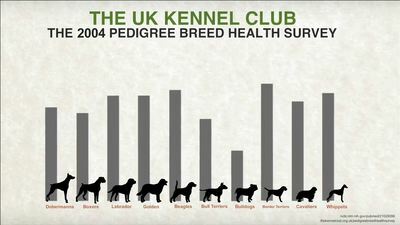 WHY ARE NR PUPPIES MORE EXPENSIVE THAN TRADITIONALLY RAISED PUPPIES? I admit it. The price tag on a properly raised Naturally Reared puppy can be a surprise. It was for me when we did the accounting on our first few NR litters and realized how expensive it was. It's not just the stud fees, vet care, and health screens that go into a mature breeding program. That's a given in my book. It's not just the incredible nursery equipped with fantastic early development activities and all the work we do to train them, desensitize them to noises and expose them to lots of environmental stimulus before they leave her. It's not even taking off work for two months to stay with them night and day. I see a lot of breeders saying that they "spare no expense" when raising litters and that usually means that they feed a decent kibble and go to the vet. Maybe they run a few health screens once or twice. And that's better than not doing it. To me, "sparing no expense" means dedicating myself to this litter completely, financially, emotionally, and physically. Our nursery has its own house, laundry, raw diet kitchen and sleep area for us. We keep the heat cranked up unbearably hot for humans to keep the puppies warm and safe while they cannot regulate their own internal temperatures. Electricity bills be damned! We have everything known to breeders on hand for emergencies including an oxygen concentrator, fresh frozen plasma, a full veterinary kit and every book ever written on raising puppies. We invest in organic, top quality raw meat prey model diet including fresh raw goat milk and locally sourced foods. We are always making organic bone broth somewhere in the house for the dogs, which Jeff doesn't think smells so great! We buy amazing supports including literally hundreds of Young Living Essential oils and supplements, Transfer Factor, NingXia Red antioxidant juice, GreenMin, Life 9 or GutSense, raw green tripe, homeopathics for immune systems, EFA's without heavy metals (hard to find and expensive, trust me), and we use nothing in our house to clean except medical grade essential oil infused cleaning products. We purchase natural alternatives to harmful synthetic antibiotics and steroids. They are not cheap. We have amazing equipment for early development including things you will find on this site like the Early Development Puppy Gym, and the Puppy Culture program. We bring in lots of visitors with different looks, smells, and energies to help the puppies feel safe around everyone. You will see me in the nursery sometimes in a black trench coat wearing a clown wig, or carrying an umbrella while I feed them. It's all what it takes to raise healthy, emotionally grounded puppies that are epigenetically sound. We fund this entirely from the sales we eventually receive from our puppies, and we very often are quite in the red when all is said and done. But why do our expenses matter to you? You just want a healthy puppy, right? It's the NATURAL REARING that is the key to all of this, and it is not cheap to maintain in a breeding program or in a nursery. My goal is to save you money on the back end. I want to keep you out of the vet's office and help you get your boxer to twice the normal life span with vigor and vitality. That means that our puppies cost more to raise and therefore cost more to buy. I believe that this program is worth every penny that we spend to make it happen and I hope that you will see the results over time as do many of our clients who have Gentry boxers now. Our veterans are proving that the program works. Ginger has outlived all of her siblings already and is still passing her intensive health screens while doing athletic lure coursing as a veteran. I want this for you too.